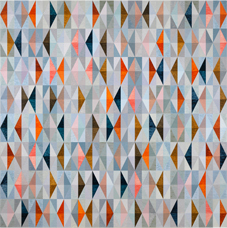 British artists Emma Biggs and Matthew Collings are known as much for their beautiful tessellated abstract paintings as their staunch defense of them. Their current show, Suspicious Utopias, at Fort Worth Contemporary Arts juxtaposes the two, asking what abstract art can mean in the age of post-postmodernism. 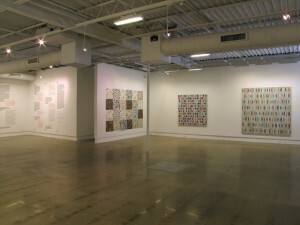 Much of the gallery space is devoted to a monumental wall text depicting artist Merlin Carpenter’s 2002 savaging of Collings’s book “Art Crazy Nation.” Interspersed throughout Carpenter’s text are Biggs and Collings’s own sharp, humorous responses which act as defense and explanation of their philosophy. 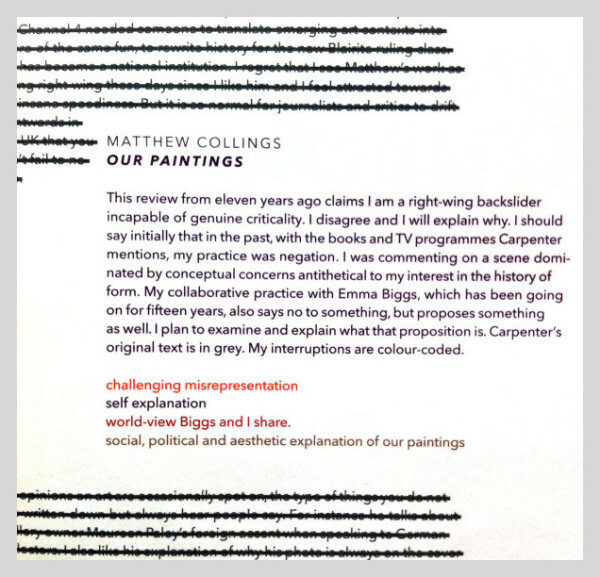 The catch is that Carpenter’s text has been carefully slashed through, making it difficult to read, while Biggs and Collings’s bright, color-coded responses give his review a critical beatdown. Winding through the wall text, the viewer finally comes to Biggs and Collings’ ultimate answer to their critics: the paintings themselves. Michael Bise: Just before I came to your exhibition, I visited the Bernini in Clay exhibition at the Kimbell. How would you compare your paintings in Suspicious Utopias at Fort Worth Contemporary Arts and Bernini’s Apollo and Daphne in the Galleria Borghese in Rome? Emma Biggs and Matthew Collings: We think there’s more connection between what we do and what Bernini does, than there is between us and a lot of art made now. In that sense, there’s some lingering Modernism in our approach. It has to do with prioritizing visuality. The mythological figures he’s representing have rich meanings capable of infinite reinterpretation, but you don’t need to know any of that to find his sculpture dramatic. What is he doing that goes beyond depiction, and beyond narrative? That dimension, the “beyond,” is what we’re interested in. At the moment in art culture, any proposal to do with “form” is considered bad. As something transcendent, it is automatically linked with considerations of ideology and hegemony, and is seen as an illusion that allows the viewer to remain blind to social realities. Hot contemporary art is interested in plugging in directly to those, and in this kind of art, form can be anything so long as it is explicable in terms of that connection. We, on the other hand, believe that plugging-in to social realities is often an illusion. We think institutional critique, for example, has become formulaic. We address this problem in the textual component of our show in Fort Worth. Our paintings don’t avoid difficult issues but neither do they spell them out as directly readable propaganda. We look at the material and the tangible. Things have to work: The colour has to be objective, it has to be meaningful on colour terms—the same with shape, line, tone—all the elements we use. We attack mystification ruthlessly. If there are comfortable illusions, we see our work as a blow against them. MB: Can you discuss the formulaic character of the “plugging-in” to social realities mentioned earlier? By formulaic do you mean ineffective? EB & MC: We feel that kind of art is obsessed with fashion, that it takes an attitude towards authority that one might call obedient disobedience. So the criticality tends either to be absurd or at best a bit academic. Of course there are different versions. The one that is easiest to knock is the comic, abject version (at least, so we see it), personified by John Kelsey and the people associated with Texte zur Kunst and a certain moment of Artforum. Privileged puppies whose whole life is a party with occasional pauses for study group meetings. And then there’s the solemn version that overlaps with the comic one but also rises above it. This goes from, say, Andrea Fraser up to Daniel Buren. That is, up to the initiators of the institutional critique tradition celebrated by the writer, Benjamin Buchloh. This is more intellectually formidable. Nevertheless, we wish we didn’t have to hear about it all the time. We reject its atmosphere of institutional sanctification. We don’t propose retro-formalism as the answer, but in the gap that institutional critique opens up, we want to force a bit of formal tough-mindedness and see what happens. That’s our experiment. MB: Why are you interested only in material meaning that exists beyond narrative? Do you believe the passage of time renders narrative inaccessible to future generations? EB & MC: The emphasis is on form in our work, but we’re also interested in interrogating that emphasis. We don’t demand the same emphasis in everyone else’s work. Neither of us is exclusively honed-in on form in art, even our own, at least not all the time. We hone in on it when we’re making something, and then we draw back and scratch our heads. Sometimes it’s to wonder if the formal proposal is working or not, and other times we’re wondering what it means for this kind of honing-in on form ever to have gone on; what did it mean in Egypt and Assyria three thousand years ago, what does it mean now? All that marvelous historical art is highly formal, dense with abstract values; it’s also packed with depiction and narrative. The latter are abundant in contemporary art, while the formal stuff is depleted, with the result that art has become slightly visually repulsive, and we’re trying to redress that balance. EB: I think material meaning has become the overlooked aspect of visual culture. The idea behind current art thought to be critical is that power works to blind people to what is superfluous to its operation, and critical art lifts those veils. I can’t help noticing that in the art world—for perfectly understandable and even laudable reasons, like fighting hierarchical patriarchal value judgments, or prioritizing meaning over means so that anyone can have a go—a close observation of the way materials work, something that was once inextricable from all forms of visual expression, is itself marginalized. In the pre-Modern Art past, as well as in Modernism, to a great extent that close observation would have been in the service of expression, and I think that is a vital difference between those artists in those pasts and what we do. Our enquiry is rule-based and narrower than what used to go on, in order to demonstrate something wide. I think there are conceptual artists that do something similar—John Baldessari for example. We relate to that moment in the 1960s and ’70s when his work often involved a series of rules and experiments that revealed something about his assumptions. I believe we do that, too, with our paintings. It might be that an observer of both him and us would assume that his experiments, because they involve sequences or photography, are “truthful” and not “judgments,” as ours certainly are. But I think that would be naive, and would assume he didn’t make judgments about the success and failure of his experiments. I imagine he shows the ones with the most visual impact and interest. When you ask if we think narrative meaning becomes obscure over time—no, I don’t think that’s the problem. 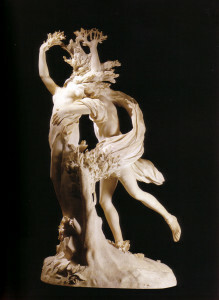 I think the narrative content of the Bernini, an expression of love and rejection, is pretty evergreen. But for reasons that may be psychological and autobiographical, I am interested in pattern, which can be linked to a sign system, as it is in indigenous art from Australia for example, or linked to meaning in other ways, as it is in Byzantine religious mosaics. Our work has a closer relationship to conceptual practice than might first appear, so that the form itself is an expression of aspects of our division of labour, or of judgment and trust. MB: By transcendent do you mean something that will be viable across a long span of history? MC: When we used the word we meant a pure state of looking marvelous, separate from any other type of significance, a notion that only has currency since the advent of aesthetics as a discipline in the eighteenth century. In our work, both the practice and the theory, we try and investigate what an intense visual appeal, without any spelled-out, obvious social or historical dimensions, could mean right now in art. In the absence of the bait offered by current fashion-conscious artists—of rather spurious political meaning—perhaps you are forced to see form’s connection to life. Initially with our paintings “form” connects to color and light, perhaps. But color and light really connect to existence. EB: “Transcendent” was a word Matt used, and as he says, it involves enduring visual appeal. I must say that lastingness, or enduringness, is something I worry about in a more literal sense. The paintings involve color judgments that time may alter. These relationships are the essence of the paintings, so potential change is a real a fear—they have to be right. Recently we started using a medium to speed the drying time, which makes me anxious in case it contributes to that change by yellowing or fading. I suppose I don’t trust a visually disempowered future restorer to be able to be true to the colors we painted. I notice that people, even artists, don’t see color, really have no idea what it is, and can’t see that there is anything to see, that a tint or a shade makes something entirely different from something else. And I recognize the blindness, because I didn’t used to know it either. I think of our work as material consciousness-raising. EB & MC: Our paintings are positively decorative. We’re aware that the word “decorative” can have a derogatory meaning, and we accept that definition when it’s appropriate. As we try and explain in the wall text at the gallery, we don’t offer the viewer a passive experience. This relates to the conceptual basis of our practice; our joining of two very different sets of skills: One of us paints while the other conceives the color and its placement. But we’re both equally in charge of criticality, of thinking about how we want the viewer to be changed when they organize in their own minds—which entails a sort of mental remaking—the visual structures that we’ve presented. EB: Artists have put down many of their visual tools; I want our work to offer a tangible demonstration of what it might mean to have skill back. A lot of contemporary art is a like a geography lesson from a liberal-minded teacher with a bent for social studies. That’s fine, but it seems to me that de-skilling is what happens to a trade before the axe falls, because the trade has been complicit with its own demise. MB: The wall text in your show addresses an article by Merlin Carpenter criticizing Matthew’s 2001 book “Art Crazy Nation.” Carpenter doesn’t mention your paintings, but if he did I assume he would say that although you speak of them as formal, visual objects, it’s really much more important to note that Matthew Collings is a successful writer and TV guy and that Emma Biggs does commissions for super rich people. He would say that your work is a product of consumer capitalist culture, bought by wealthy people who don’t care about your intent and who just use your paintings as decoration. By choosing not to address this social context you are working in bad faith. If you are not avoiding difficult social realities, how do your paintings critically approach these realities? EB & MC: They approach them analogously. They don’t say, “Do this and the consciousness of the people will be raised.” They say, “Look at this, understand that it is impossible to see everything that is there right away, you have to work at it, you are actively involved in this thing—now think about society, and how everything that makes it up is not immediately revealed either.” So our paintings have a metaphorical relationship to those realities. EB & MC: Our work criticizes visual ignorance and visual blindness, which are in turn connected to other kinds of non-seeing, political and moral and so on. Carpenter assumes, as many people in the art world do, that only certain well-rehearsed approaches to critique really count as critique. In other words, there’s an orthodoxy and he is one of its self-elected policemen. But his rulings, as our wall text points out, are often about his own career positioning and tend to involve rather idiotic claims. We like his later writings for their paranoid bitterness and questioning of self, and we like the black humor of his artistic set-ups. But we don’t like it when he is priggish and self-serving. In any case he isn’t a big deal for us either way. We take a different critical route: We’re interested in an art that overwhelms the senses, and in developing a self-conscious critical position that could rationally accompany that kind of experience. We find less-than-overwhelming artistic proposals depressing, even when it’s the greatest of the greats; when it’s Martin Kippenberger, for example. But we’re not blind to Kippenberger’s aesthetic any more than we are to Carpenter’s. MC: We force the viewer to ask what loveliness in art is, what pleasure is, what makes them work and what drives people to seek them out. If something jars or is wrong or doesn’t work, why is that happening and why is it a problem—what constitutes a false move? The social implications of this kind of of questioning are not so hard to see. MB: Do you believe that it is possible to make art with a contemporary narrative that may someday be as little acknowledged as the myth of Apollo and Daphne is now, and still be rigorous enough to maintain its integrity in the transcendent way you mentioned previously? EB & MC: We are fine about contemporary art that has narrative meaning. We are not even closed-off to that possibility in our own work. It’s just that at the moment we’re not considering it. MC: The idea of a split in art between visuality and narrative only goes back a couple of centuries. It has its own science, the discipline of aesthetics. But it also has certain other traditions. Its own moralizing, its veneration of handicraft and its cults of spirituality and the great genius individual creator—and this whole latter set of notions holds as little interest for us as it does for the institution critique people. We’re fascinated by aesthetic theory but we read it through the lens of the present, not in a spirit of false, golden-age nostalgia. I’m trying to think of some examples of narrative art that interest me. We’re both great fans of Raymond Pettibon, we respond to his break-up of narrative. 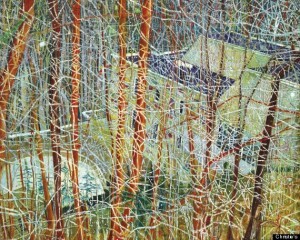 But we’re also fans of Peter Doig, we just don’t particularly think about his narrative meanings, we see through them to the formality, to the surfaces, the rhyming contours, the visual organization and so on. I think in Pettibon’s case “narrative” is a powerful element because it’s so relentlessly attacked and then stimulated back into life and then attacked again, so you’re forced to be aware of it, and forced to bring into consciousness narrative’s complicated position in social relations. You’re not of course asked to believe in a narrative about Poe, or Hawthorn, or Sergeant Fury, but you’re forced to think about mass narratives, narrative that is so big you can’t see it. I think Pettibon’s a good example of addressing social realities unpredictably, so the address is energetic and not formulaic. With Doig, narrative isn’t powerful. We both think of his narratives as containers that the wealthy collectors you spoke of earlier need. There’s a tradition of that kind of thing in painting, with Francis Bacon at the top of the ladder. It’s quite different from what Picasso, for example, does where form and content are always energetically fused. Biggs and I simply get used to editing out the promotional commentary that goes with Doig and Bacon, which never bears examination anyway, and in the same way editing out the actual narratives and seeing, instead, these artists’ surfaces, the paintwork and the visual trawling they both do through art history; we appreciate the energy on that level and we try and think how that level connects to society. The other level is an illusion; it’s all about fantasies of the artistic life. Pettibon is sounder, theoretically. MB: Where do you think this more recent phenomenon in art, of de-prioritizing visuality as a useful method of communication, comes from? EB & MC: Societal and technological changes led to the moment of Modernism in which skill started to be undermined. Then in Post-modernism a visual order indebted to the mass media took priority over one connected to visual traditions built up over many centuries—Modernism was about rehabilitating such traditions, not simply chucking them out. So in the present moment, changing priorities have resulted in an expectation that art needn’t be “made” in a way that has anything engaging or compelling about it. And in fact making, as such, has become a non-issue. Even where old forms such as painting and sculpture are concerned, the making is not expected to be the significant dimension. Instead, sign and image are the meaning zones, as with a certain kind of Surrealism or a certain kind of Pop. Meaning hovers in an indeterminate non-place between the object and its wall label. MB: You favor a visual experience that can be understood apart from its social implications. You also indicate that this is not your sole area of interest for art in general. You mention your appreciation for Carpenter’s self-questioning and bitterness. I think of artists like Richard Phillips, who recently had an exhibition at the Fort Worth Modern, or Josephine Meckseper and other artists who offer a critique of consumer capitalist culture that has allowed them to participate in that culture in such a way that one might accuse them of complicity. Do you take moral stands against artists regardless of the visual integrity of the work they make? Do you question artists’ motives? EB & MC: We think ethical art is a bit like ethical coffee: It’s a valve that capital produces to let off dangerous steam in the system. For us, transformation is the key, in art as in society.